As far as email clients go Gmail has a number of strong points. First, it provides an incredible amount of free online storage capacity (almost six-and-a-half gigabytes), a big plus for people with smaller hard drives who prefer to keep their old email. Second, you can access your mail on any computer with a web browser. Third, it comes with Google’s excellent search engine built in and, last (but certainly not least these days), it has very effective spam-filtering. It’s web-based, which is a show-stopper if you need to access your emails offline. There’s no desktop integration – for example you can’t create attachments by dragging files into a new message from the Finder. Many are put off by the idea of having all their email archived on remote servers although, arguably, this is just as vulnerable residing on their own computers. Users have to put up with advertisements, though to be fair these are very discreet. The minimalist user interface may not be your cup of tea. Which brings me to Mailplane, an application designed to address some of these weaknesses by integrating Gmail with the Mac desktop. This application sandboxes Gmail to approximate a traditional desktop email client (the email itself remains in cyberspace), which I think is a nice touch. The toolbar is certainly useful; it saves fiddling about with some of the less-than-intuitive elements of Gmail’s user interface. 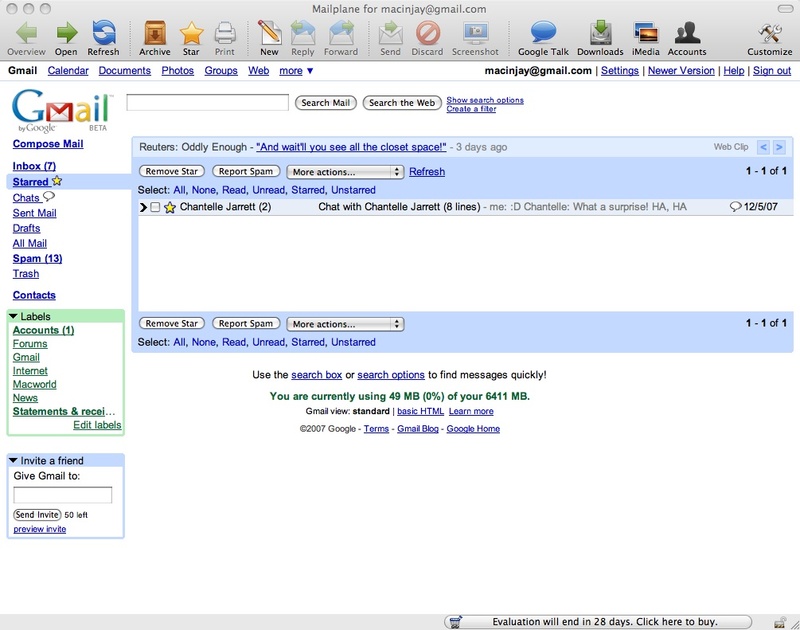 Most of the toolbar buttons serve as alternatives for those already found in Gmail – “Discard” for “Delete” for instance. However some of these activate features not available in Gmail itself. For example you can easily access photos, audio and movie files by clicking on the iMedia button, then drag and drop them onto the Mailplane window to attach them to new messages. Other nice touches are the Mailplane shortcut in the OS X menu bar and Growl support. Stacks and Spaces are entirely new applications in OS X. The Finder on the other hand is the most venerable Mac application, going all the way back to the original 128k Mac. Essentially it is the Mac equivalent of Windows Explorer (although there are of course many differences between the two). I won’t bore you with a history of the Finder but those interested can read about it in this Wikipedia article. Instead I’ll concentrate on the major changes made to the Leopard Finder. First of all the sidebar has been redesigned. It now looks a lot like the sidebar in iTunes, as can be seen from the screenshots below. In fact the changes to Finder’s sidebar form part of a unified theme that Apple has established for the operating system with Leopard. Which is not to say that the change is purely cosmetic; as you can see the Finder sidebar is now divided into discrete categories i.e. devices (cameras, disk drives etc), shared resources, folders (Places in Leopard parlance) and searches. It is still possible however to add folders to the Places section in the sidebar. In the searches category Apple has thoughtfully included some useful smart folders out of the box, but these can also be added to. Incidentally, accessing shared resources has become a lot easier in Leopard. When a resource is available on the network it automatically appears in the sidebar. Connecting to the resource is now just a matter of clicking on the resource icon. A big improvement over Tiger here in my opinion, where connecting to other resources on the Network always seemed to be a hit-or-miss affair. 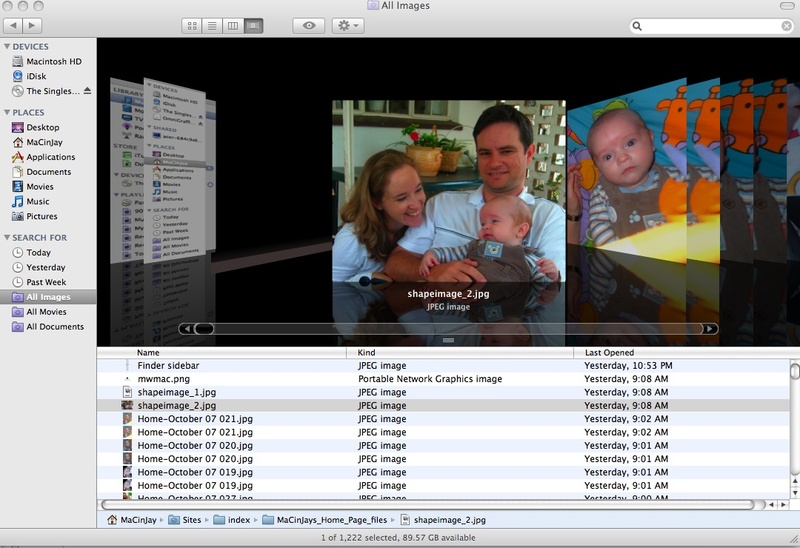 Other significant enhancements to the Finder are Cover Flow and Quick Look. In the past the user was restricted to three views in the Finder: icon, list and column. In Leopard there is now another view to choose from, namely Cover Flow. Along with the new sidebar this is another feature that the Finder has borrowed from iTunes and one that many non-Mac users will be familiar with. It enables the user to browse documents, images, folders and applications as if flipping through album art in iTunes. Some purists have questioned its usefulness, preferring the traditional finder views. Personally I think that Cover Flow is a useful addition, especially as an alternative to iPhoto for browsing photos. That concludes my brief review of Leopard’s new Finder. While it wasn’t completely overhauled as some wanted I think that overall the changes represent a significant improvement over the Finder in Tiger. One of the new features that I really like in Leopard (although I appear to be in a minority here) is Stacks. In the past my Desktop used to be cluttered with files and folders, which had to be periodically cleared away in a virtual Spring-cleaning exercise. No longer! Essentially Stacks are folders placed in the Dock (which sort of acts like the strip at the bottom in Windows where you can launch programmes and files, only in a lot more user-friendly way) in order to access your favourite files. Leopard has two default Stacks, one for Documents and another for Downloads, but these can be removed or added to. When you click on a Stack its contents spring out fan-like from the Dock. If there are more files than can be accommodated in the fan there is a “Show in Finder” option. Alternatively you can revert to a grid view by right-clicking on the Stack (or by pressing CTRL/COMMAND with the mouse button for those with a one-button mouse) and choosing that option from the pop-up menu. There is also an “Automatic” option which will switch from the fan to grid view in need, as well as alternative file-sorting options. It could be argued that Stacks is one of the more underwhelming features in Leopard. After all it was possible in the past to place folders in the Dock. (In fact Apple has been criticised by many for removing the ability to navigate hierarchical menus. I don’t share this point of view because I have always found it easier to navigate files in the Finder, but each to his own.) While there is some truth in this, Stacks scores points in my book for enabling this feature out of the box. Others may not appreciate the eye candy of the fan effect but in my opinion it is an elegant solution for those who want quick access to their favourite files without having to revert to the Desktop.